January proved to be another milestone month for the new car industry, with 174,564 vehicles registered in the first 31 days of 2017; that’s a marked 2.9% increase compared to the same period last year, and the highest levels of January registrations since 2005. It was private registrations that provided the strongest growth figure of 5%, accounting for 76,729 cars. Fleet demand also continues to grow, up 1.4% year-on-year, representing an extra 1,200 registrations compared to Jan 2016. In spite of the rather modest 1.4% increase in fleet (which includes personal contract hire), our own data reveals that personal leasing enquiries at ContractHireAndLeasing were up 36.8% year-on-year. In what is notoriously one of the quietest months of the year for new car registrations, it was alternatively fuelled vehicles (AFVs) that made the biggest splash, with demand up 19.9% compared to last year. With an extra 7,279 AFVs hitting the road in January, the sector now accounts for an impressive 4.2% of the new car market. 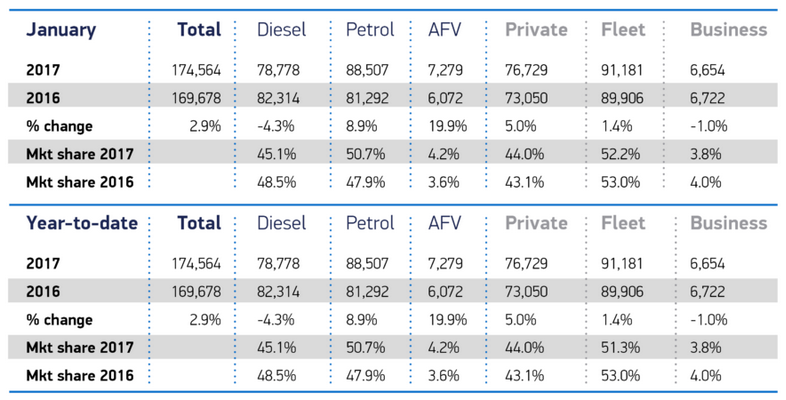 The rise in AFVs seems to have taken a chunk out of diesels market share, which saw a –4.3% drop compared to January 2016. This means petrol is now the most popular type of fuel, making up 50.7% of all January’s registrations, compared to diesel’s 45.1%. 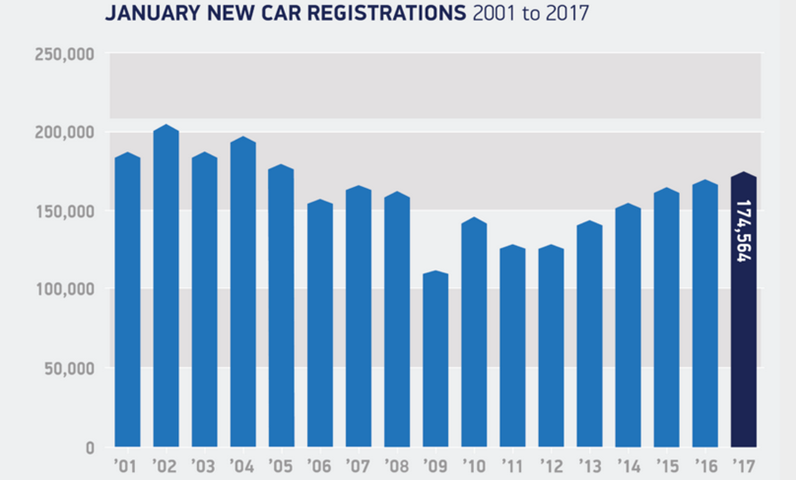 While January’s registrations proves that the UK’s car market remains robust and competitive, the new car market is still expected to cool somewhat over the next year, with 2016’s record-breaking number of new registrations predicted to be hard to match. 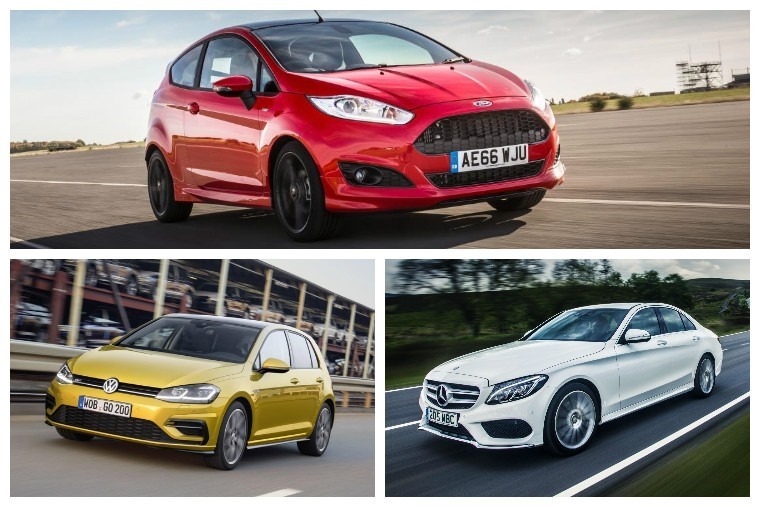 It’s business as normal as we break into 2017 for the top ten best-sellers with the Ford Fiesta retaining its crown with a healthy lead, while the other usual suspects start to fight it out and find their place.